I need a design done that I would like to put on a t-shirt. 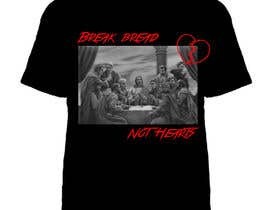 I attached three different pictures of Jesus breaking bread at a table. I have decided which one I wanted. So which ever looks best. I would like the photo in black and white. 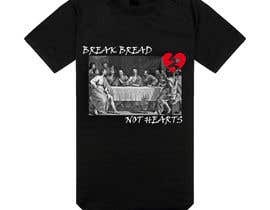 Then I would like writing that says "Break bread Not hearts" on the shirt. I will upload a example pictures of where I want the words to be position on the image. Also I attached another picture of the font style I want the phrase to be in. 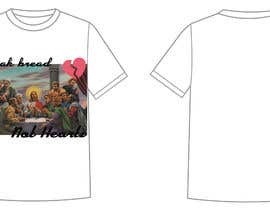 I also would like a broken heart on the picture. 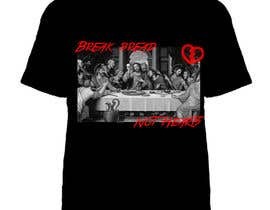 I would like the the broken heart to be in the same font as the [login to view URL] placement of the broken heart I also put in the example photo. And please excuse me example drawings, I am not an artist. You can also send me examples of your creative ideas if you think some other font or placement of the words look better. I would like the phrase to be in the color hot pink and the broken heart. Thank you and I hope you can create my vision. #8 Sir check, its in pink, and is it possible to chat with me ? Font name is "True lies" to other freelancers.